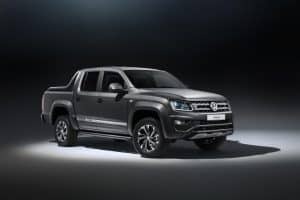 The Volkswagen Amarok is one of the youngest models in the pick-up market right now, launching in the UK in 2011, but it has wasted no time in making a name for itself and becoming a much respected segment staple. Now, a new special edition Amarok is being offered as VW’s rufty-tufty pick-up nears the end of its first-generation run. Priced from £33,650, the Amarok Dark Label takes the range-topping Highline trim and bolts on several premium features to create the most luxurious variant to date. That means you get striking 18-inch Rawson alloy wheels, matte black side-mirror casings, black door handles, a black rear bumper and exclusive ‘carbon steel’ grey metallic exterior, along with side bars and a rear styling bar finished in matte black, while various Dark Label decals complete the exterior design package. Inside, the Amarok Dark Label’s seat covers are finished in Alcantara with black headlining and vent bezels, trimmed in chrome silk gloss. Both front seats have manual lumbar adjustment and unique Dark Label floor mats. Tech-wise, there’s Volkswagen’s most advanced technology yet, including the Discover Media 6.33-inch touchscreen system, rain-sensing windscreen wipers, automatic headlight control, and power adjustable, heated and folding door mirrors. Under the bonnet, there’s a highly versatile three-litre V6 engine, producing 201bhp and 500Nm of torque between 1,250-2,750rpm, linked to an eight-speed automatic gearbox and a permanent four-wheel drive. It doesn’t skimp on practicality or safety either, boasting the widest load platform in its class and a host of advanced safety systems that include automatic post-collision braking, ESP and trailer stabilisation. Only 200 Amarok Dark Labels will be produced and, if you like the sound of all of this, you can order one now and expect to have the keys by May.